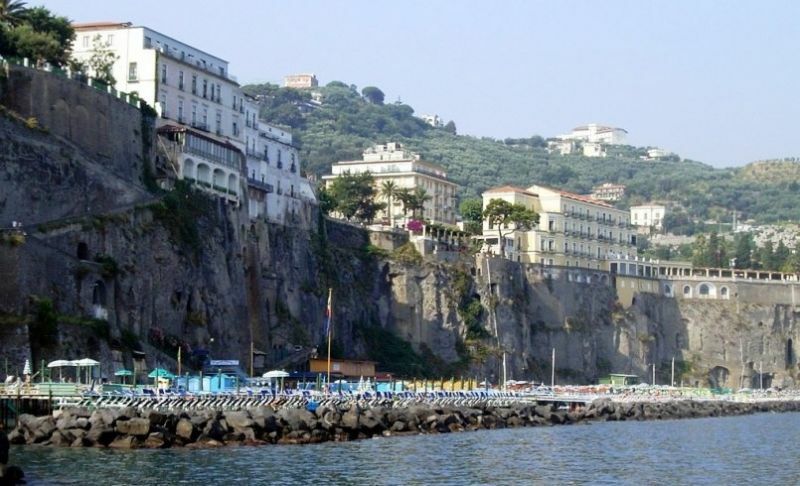 Sorrento’s main attraction is its strategic position overlooking the Bay of Naples towards the Vesuvius. Besides, it is close to the most untouched countryside of the region and the Amalfi Coast. north of Sorrento is Pompei and looking onto the sea you have Capri. Unsurpassed. The busiest town life develops in the historic centre. Surrounding Sorrento the hilly quiet landscape is called the land of the sirens because of the creatures inhabiting Li Galli islands. Follow ancient paths and visit dormant villages around it, Sorrento will always surprise you. The most important sightseeing is done around off Piazza Tasso, its meeting point in the historic centre, where streets are narrow though fully packed with tourists. Corso Italia which becomes pedestrian only sweeps through the historic centre. The centro storico is carpeted with souvenir shops, bars and restaurants among which is the medieval Sedile Dominava where only a select few gathered in the Middle Ages. Its tourist information office is on Via Lungi de Maio. It supplies a magazine and handy information about Sorrento. Do not judge the cathedral (Corso Italia) by appearances. Indoors it is a magnificent combination of details. The façade was incorporated in the 20th century but inside is the 16th century bishop’s throne made of marble, the local marquetry wooden choir, an original 15th century side door and the bell tower supported by an archway. A great sight is the cloisters of the Chiesa di San Francesco (Via San a Francesco), a pastiche of crossed arches and round arches based on octagonal columns. The cloisters play host to concerts between July and September. The patron saint’s remains area kept in the crypt under the baroque Basilica di Sant’ Antonino. The whale bones represent the miracles which he supposedly worked when he saved a child from within a whale. Its celebration on 14th February is held with processions and markets. Museo Bottega della Tarsia Lignea (Via San Nicolà) displays many archetypes of pieces of furniture made in the local style called intarsio. It also houses paintings, prints, photographs of Sorrento and the environs. Its most important museum is the Museo Correale (Via Correale) occupying the villa which once belonged to the Correales. It features an array of 17 and 19th century Neapolitan pieces of art, oriental and European porcelains, pieces dating back to the Antiquity, clocks and furniture. To admire a great view of the bay and Mt Vesuvius head for Villa Comunale Park where buskers fill the atmosphere with their music and people sit on it s benches. Marina Piccola and Marina Grande are the two beaches in town. The restaurants and houses give onto Marina Grande where you may hire umbrellas and deck chairs on its jetties. Marina Piccola is a little beach off the centre which overflows with youngsters. An option for good swimming in crystal clear water is to head for Bagni Regina Giovanna . Via Capo or a bus lead you there. Its is located by the ruins of a Roman villa. By renting a boat you can sail the coast and find the best coves to bathe which are heading south or west. Boat hiring is available at Sic Sic at Marina Piccola. Expert and novice divers can have courses organized by Sorrento Diving Centre at Marina Piccola. Why not to enrol in a cooking course at Sorrento cooking school? Head for Viale dei Pini to learn how to get to the heart of Italy. Angelina Lauro (Piazza Angelina Lauro) is both a self service and an a la carte restaurant. Anything you order comes in generous portions. Da Emilia ( Via Marina Grande) is the traditional trattoria to come, relax and savour generous portions of seafood or pasta. For vegetarians Mondo Bio (Via degli Aranci) makes the perfect place serving pasta and tofu dishes. Ristorante Il Buco (Rampa Marina Piccola) located in an ancient wine cellar prepares creative cuisine and offers elegance. Its Michelin award was deservedly given. BY BOAT: from Naples (length: 35 minutes, services: 15 a day), to Capri (in the summertime, every hour, services: up to 15 a day; in wintertime there are fewer services. 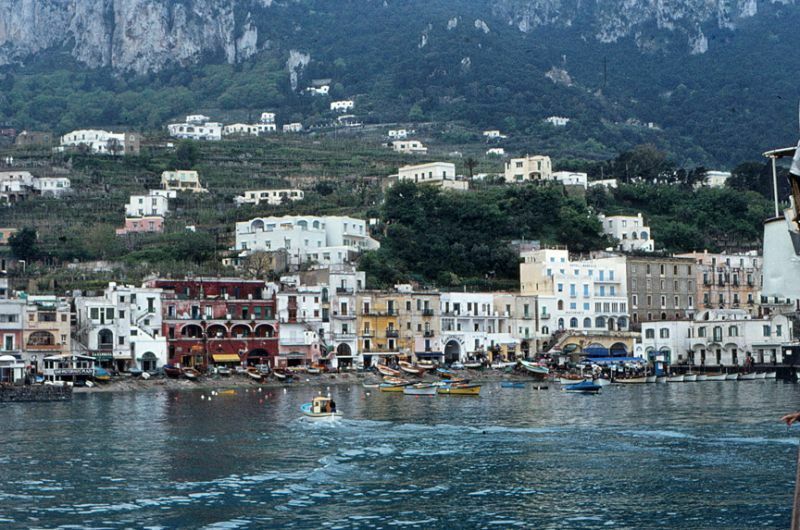 ), to Amalfi (services: 33 a day). BY BUS: to Naples Capodichino Airport leaving from Arrivals Hall (services: 6 a day), to/from Rome departing from Piazza Angelina Lauro in Sorrento (services: 2 a day), to Amalfi (length:1.20 hours, services: 2 a day), to Naples (length: 1 ½ hours, services: 12 a day). Local buses operate Marina Piccola, Sant’Agnello and Marina Grande. Tickets have to be purchased at the tobacconists. BY CAR OR MOTORBIKE. From the north drive along the A3 as far as Castellammare di Stabia where you have to exit and then turn into the SS145. Scooters and cars can be hired and many are the options. Hertz and Jolly Service & Rent are on Via degli Aranci. BY TRAIN: to Naples (length: 1.10 hours, services: every 30 minutes). ON FOOT: it is the recommendable way of exploring Sorrento for cars are banned in the centre and everything is within walking distance.